"Lessons had been learned from Iraq ...that means more forces," Gates told journalists in London. General David McKiernan, the US commander in Afghanistan, has asked the Pentagon for three more American brigades in addition to the extra one already announced by President Bush and due to be deployed in January. 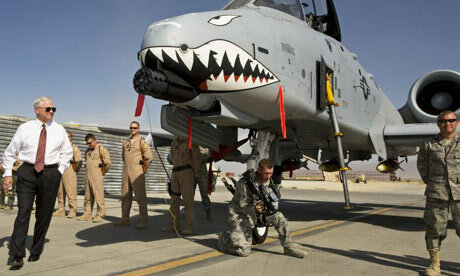 This would increase the number of US troops in Afghanistan, at present numbering 30,000, to nearly 44,000. It remains unclear, however, whether Britain will increase its military presence in the country after the bulk of the 4,000-strong garrison now stationed at Basra airport leaves Iraq, as expected, in the first half of next year. There are now about 7,800 British troops in Afghanistan. Gates, in London for a meeting of Nato defence ministers, said that "the UK may increase the size of its force [in Afghanistan]". However, the Ministry of Defence was quick to deny there were any new plans to increase the number of British troops there. An MoD spokesman said: "Force levels are kept under continual review and an uplift of approximately 230 personnel was announced ... on June 16." The British government's priority is to get better and more equipment, notably helicopters and armoured vehicles for its troops in Afghanistan, defence officials say. Gates said he expected "substantial commitments" from other allies for other purposes. "One of the issues I will be raising at the [Nato] meeting is that we need as an alliance and with our partners to figure out a way to help pay for [doubling] the size of the Afghan army," he said. "The capability of the Afghan army ultimately is the exit strategy." A US official said yesterday that the plan was to double the size of the Afghan army from the present 65,000 in five years. That would cost an estimated $20bn. "We can see what those countries which are not contributing troops can contribute financially," he said. That plan, which could include countries outside Nato, such as Japan, "makes sense", he said. Admiral Michael Mullen told the US congress last week he was "not convinced we're winning it in Afghanistan". Gates yesterday distanced himself from the comment, referring instead to "increasing challenges" and a more complex conflict. It was not just a fight between foreign forces and the Taliban, he said. He referred to "a kind of syndicate working together" consisting of the Taliban, foreign fighters, and supporters of Gulbertin Hekmatiyar, an Islamist militia leader. "Syndicates of different players [present] a different kind of challenge," Gates said. He added: "Clearly a piece of the problem is governance and corruption fuelled by the narcotics trade." In common with Des Browne, the British defence secretary, Gates said Afghanistan would remain a "long-term" problem. He addressed two other sensitive and difficult issues - relations with Pakistan and the number of civilian deaths caused by US bombing raids in Afghanistan. He said US military chiefs, including Mullen, were in close contact with the new Pakistani leadership leaders. The "most productive path" in dealing with al-Qaida, Taliban and other insurgents based in Pakistan's north-west tribal areas was "in cooperation with Pakistan", Gates said. However, he did not comment on the role of US special forces - which do not come under the command of US generals in Afghanistan - in cross-border raids. Gates disclosed he had issued new orders to US commanders in Afghanistan, instructing them to consider carefully the risks of civilian casualties. He added that the US had been "on the wrong side of strategic communications" - in future the US would apologise and compensate families first - and investigate afterwards. "The issue of civilian casualties is very important to us. We try to make sure they do not occur and we work cooperatively with the Afghans and others like the UN should incidents occur." Meanwhile, Richard Boucher, the US assistant secretary of state for South Asia, was in London consulting British Foreign Office officials about developments in Afghanistan and Pakistan in advance of next week's UN general assembly session, which Pakistan president Hamid Karzai will be attending. Boucher told the Guardian. "The loss of life is a tragedy but it also has a political impact. "It's very hard because we are dealing with an enemy that intentionally goes out and blows up civilians in markets and on buses, that hides in villages and farmhouses to shoot at us, though we recognise we have to be extra careful." McKiernan has warned that the chronic shortage of US troops is forcing commanders to rely more on airstrikes, that can kill innocent civilians. The US admits that the Taliban have become more organised and are working more closely with al-Qaida.